It’s been a crazy month for the world of Batman. Bruce Wayne found himself targeted by angry god from a twisted version of the Multiverse, while seven evil and twisted versions of himself appeared and began wreaking havoc on the DC Universe. In fact, it’s such a big deal that I couldn’t talk about it myself. Thankfully, fellow Bat-fan Sean Morse has joined me to discuss Metal #3, the Dark Knight one-shots and Gotham Resistance! So let’s get a little summary out of the way, and then dive in! In Batman: The Red Death, Batman: The Murder Machine, and Batman: The Dawnbreaker (we didn’t have The Drowned available when we sat down to chat), we learn the origins of these tragic and twisted versions of Batman, and then each of them launch an attack on the Justice League and various cities within the DCU. Then, spinning out of the Dark Nights: Metal event, comes the Gotham Resistance! Gathering a team of unlikely heroes, Damian Wayne enters the newly transmogrified Gotham City to find his father. Some of the Bat-family’s greatest rogues have been gifted their own realms and power over reality by The Batman Who Laughs, who sits at the center of the maze pulling the strings. Along the way he teams up with his own group, the Teen Titans, as well as Nightwing, the Suicide Squad and Green Arrow, who are trying to reach Challenger’s Mountain, the epicenter of the universal disturbance. And then in Metal #3, Superman awakes after Barbatos’s attack to a planet under siege. After trying to confront the Dark Knights, he’s rescued and taken to the Oblivion Bar, where the remaining Leaguers and various other heroes develop a plan to strike back against Barbatos. Superman then leads Steel and the Flash to the Fortress of Solitude where he uses an Anti-Monitor tower to reach Batman… but what awaits him there? TT: So Sean, where do you want to start? Gotham Resistance or the Dark Knight one shots? SM: Let’s go through the one shots first, were there any standouts for you? TT: Oooh the Red Death for sure. I enjoyed the Murder Machine on a conceptual level, and Dawnbreaker was brutal. Red Death just worked so well for me on a story and concept level though. I’m so haunted by it. SM: I did like that they brought the creative team over from Flash to handle the Red Death. Murder Machine did seem like the most believable story so far though, just because you would expect losing Alfred to cause him to snap. Some of the other books just seem like he was going to be evil regardless of circumstance. You were right about the Dawnbreaker being brutal! Just flipping through the issue, you see a very different version of Bruce from a young age. What do you think of that approach, him turning to evil right after the loss of his parents? TT: Yeah, definitely. I think that’s why I didn’t enjoy Dawnbreaker quite as much. But Red Death and Murder Machine were both fueled by loss. It felt more real.That said, I thought Dawnbreaker was scary. I think it shows why it was good that Bruce had time to process his loss before becoming Batman for one. SM: You’re right, it does line up with him going through those early years of anger before finding his mission. TT: He wasn’t just fueled by his will. He was fueled by rage and revenge. I think seeing what effect he has on the emotional spectrum would be an interesting perspective on him. This is clearly a rage fueled, fear inspiring being. Much unlike the actual Bruce. SM: Yeah, Bruce does exhibit the extreme versions of all the emotional spectrum regularly! Sciver was a good choice for art. Not surprising that he can draw the heck out of some Lantern action, but I think he’s on the top of his game here. TT: Agreed. He has such an amazing untapped potential for horror too. I’d love to see him on a straight up horror book. Going back to Red Death really quickly, what did you think about the revelation that he’s a composite of Bruce and Barry? TT: Exactly what I’m thinking. If any of the Dark Knights were to betray the others and help the DCU, I feel that it’s him. Whether it’s just the voice in his head, or Barry having more direct influence. With OUR Barry facing him in the next round of tie in stories, I guess we’ll see. SM: Agreed. Considering the “have our cake, and eating it too” approach both big companies are showing by having multiple versions of most characters, would you want any of these versions to remain in the DCU proper after the event? TT: Of the ones we’ve had one shots for? No. Not on regular basis. But in a future multi verse spanning event? I’d love to see them again. I’m sure not all of them will survive this event, but any survivors would be great foils in the future, if used sparingly. What about you? SM: Same. [Also] I’ve honestly been looking forward to the Batman The Merciless and The Batman Who Laughs one shots the most. The BWL version seems to be the most interesting, and Merciless just hasn’t been explored at all yet. We did get a small peek into The Devastator’s origin in DN:Metal this week. Doesn’t seem too different from other times Batman has had to dispatch Superman. TT: So what did you think of each of the one-shots? What would you rate them? SM: Sure, I’d give the Red Death 8/10, Murder Machine 6/10, and Dawnbreaker 8/10. TT: Cool, I’d say 8/10 for Red Death, 6.5/10 for Murder Machine and 7.5/10 for Dawnbreaker. We’ll have to reconnect when BWL is out at a minimum. So lets move forward. Gotham Resistance. What have you thought? SM: I hadn’t realized this was even happening until this week’s editor’s note in Metal #3, but I really enjoyed this departure. I would have read a whole event based around this! It was disappointing that each villain only got a single issue, if that. TT: I agree! This was a very fun, very crazy mini-event! I thought it was a LOT of fun. Didn’t expect to say that going into it honestly. SM: Yeah, I enjoyed the GoT version of Mr. Freeze! There have been a lot of different takes on the “Metal” theme, whether it be rock music, giant robots or medieval weapons and armor across the event, but this might have been the most realized version. TT: Yeah I think more than anything Resistance seems to establish how screwed everyone is. Especially finishing up right before Metal #3. The Batman who laughs is bad news as he’s just a lackey. Did the reality altering abilities surprise you? Did you think that came from Barbatos, or they’re a part of the BWL’s natural skills? SM: A little bit. They didn’t allude to it being Barbatos’ powers, but that would make more sense. When you add in BWL’s vampire-like coven of Crows, and whatever power of his that’s controlling them, he does seem overpowered for a Batman/Joker mashup. TT: That said, I think each issue was pretty much the same plot. Heroes enter villain’s realm, fight villain, learn a little more about threat to the city, then a last page twist. I would say that was the only real downside though. The individual issues varied enough in execution that it wasn’t really a problem. Each story was a lot of fun. SM: Yeah, that was probably the highlight of the whole event for me. The art style jumped around a bit, but high quality overall. TT: I think the Suicide Squad issue was the highlight for me. You? I think the Suicide Squad issue was the highlight for me. You? You had asked me about BWL’s powers, do you think there’s something more going on there? TT: I wonder but I don’t know what. It was really an interesting story. And reading Metal #3, I’m glad it had consequences. It was a really important part of Metal! And speaking of, let’s move into Metal #3. So I have to say that I loved where Snyder picked up the story. SM: Same place it ended, to some degree. Yeah, those first few pages really helped twist the knife once we saw how bad the world had gotten. I had forgotten that we actually got a small glimpse of Barbatos there. TT: That fake out in the first few pages was so genius, even if it was obvious. But wow, it did get bad. SM: What did you make of the jukebox page? Do you think Snyder has an actual song in mind, or is it just hyperbole? TT: Knowing Snyder, he totally had one in mind. No idea what song but totally had one. SM: Strangely, I just noticed he says B-sixty six, and if you count this main series and it’s prequels as Batman books, this is Snyder’s 66th issue of “main continuity” Batman. Actually, the next issue would be 66. TT: I didn’t catch that at all! SM: Never mind all that, it’s Batman 1966. The Nananana’s. I made that connection before, but I didn’t think the villains would be playing that song. Honestly just more confused about it now. TT: Haha! Well it was an interesting thought! So I have one major complaint about the issue. I really don’t like the trope of a Batman focused story making Superman look like a chump. It’s even more frustrating this issue because Snyder writes Superman REALLY well. 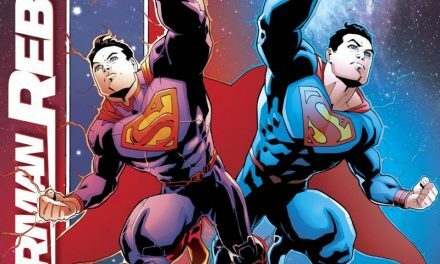 SM: I feel like people take Superman being a boy scout as him being a chump, to some degree. TT: But here, Clark was written as so naive and blindly hopeful that it came across pretty poorly. TT: Agreed – knowing how well Snyder usually writes Clark, I think it was just a misstep, or he had a specific plot point that he needed to get to. And that’s an interesting theory. Do you mean, Barbatos’s power is illusion not actually altering reality? SM: Well, that’s the thing. We don’t really have any idea of what Barbatos is! I’m half expecting him to pull down his hood and be Thomas Wayne or something! They make reference to him being from Final Crisis (or a tie-in at least) but I didn’t come across him. TT: That was one of the Return of Bruce Wayne issues but I don’t remember for sure. I need to go back and re-read that now. TT: That’s very true. He does get a moment that I think he’ll try to take all the Dark Knights and at least make a damn good fight of it. SM: That’s what we need to see! TT: A few pages of that brawl before Barry showed up would have been AWESOME. And speaking of that HOW GREAT WAS BARRY’S ENTRANCE?! SM: Yeah, Capullo’s doing some amazing work. I was glad to see Dr. Fate show up too. I was wondering were the Darkseid baby from last issue went, and found that they continue that story in Wonder Woman #31, so I’ll probably check that out. TT: So do you think that story comes after Metal then? SM: Or he reappears in this book. Something having to do with the Dark universe and the Anti-life Equation, maybe??? SM: Did you want to rate Metal #3? TT: I’d say it’s the weakest of the series so far but still was pretty great. 7 of 10. Honestly, this issue probably will end up better in the trade later, or in a binge read when it’s all out. TT: Awesome! This was fun! Thanks for sitting down and chatting with me!